The proportion of people with disabilities is greatest in the least developed countries of the world. The poorest of the poor, the most marginalized, and most vulnerable people are those with disabilities. The most exploited and at risk of violence, sexual abuse, neglect, homelessness, and natural disaster, are women and girls with disabilities. 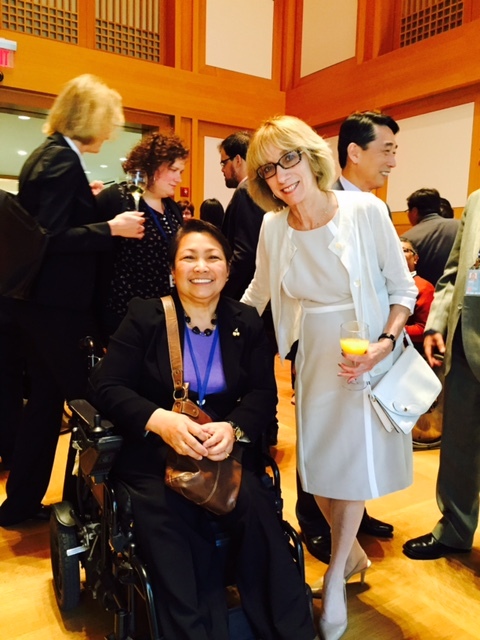 These are the messages supported with documentation and presented this month at the 8th Session of the United Nations Conference of States Parties ( meaning governments) on the Convention on the Rights of Persons with Disabilities (CRPD). I am part of March of Dimes Canada’s delegation to the conference, at which we have accreditation. I am in NY along with two members of our Government Relations Department, and we have split up to cover as many sessions as possible, including those plenaries at which governments report on their actions towards meeting commitments within CRPD, and side events, sponsored by NGOs, UN agencies, governments and academics. Of course all is not negative, gains are being made, but not equally around the globe. We’ve learned of progressive legislation, embodying principles of the CRPD, such as in Germany and Australia. Canada sponsored a session on collection and use of data, and highlighted the Canadian Disabilities Survey of 2012, which clearly caused envy among representatives from countries which have zero data on disability, yet experience it significantly and have poor planning mechanisms. I was especially proud, as I listened, to realize that the Accessibility for Ontarians with Disabilities Act, now in its 10th year, could be a model for other jurisdictions. But like many who reported, we need vigilance to ensure compliance, we need enforcement to make it work. The Israeli delegation from the NGO, Beit Issie Shapiro, partnered with big tech giant Google, small tech company Sesame Enable, and the German and Israeli UN Missions, to present exciting advancements in assistive technology. An American partner provided an interesting context as well showing technology that opens doors for inclusion of people with disabilities. This conference has several overarching themes including, “Nothing About Us Without Us,” “Achieving Cross Sectionality,” and “Sustainable Development Goals for All People.” The former has been the battle cry since at least 1981 when the first world wide consumer-driven organization was created in Canada, Disabled Persons International. I remember it well. At this event every session repeated this mantra, every session included significant numbers of people with disabilities and communication in various sign languages and with captioning has been available. No longer is it acceptable to plan services, to deliver services or consider the needs of recipients without their direct involvement. The second theme has been introduced more recently and speaks to the drive to bring marginalized groups together. Since 1981, the voices of different segments of the population with disabilities have built coalitions and alignments, recognizing shared goals for inclusion and access. Now the call is for indigenous people, LGBTQ folks, women’s groups and racialized advocates, to work together with disability advocates to gain rights, to reach full inclusion and equal opportunity. The last theme is best expressed by the idea that at every table, ie at every issue affecting humankind, let there be a voice for people with disabilities. After all, they are affected too by economic policy, social policy, climate and health care etc. For example, there are no concerns of women that should not include women with disabilities, from maternal and child care to education, employment and more. So as the United Nations and its many agencies develop their next set of SDGs (Sustainable Development Goals), people with disabilities demand to be included, thus moving our common humanity forward. My mind is dominated by images of gender-based violence against women and girls with disabilities, which has increased substantially due to war, catastrophic disasters, and poverty. The world has to intervene, conflicts need to cease, risk planning has to improve, governments have to put people first, civil society organizations must cooperate, and people with disabilities need to be empowered. We need recognize the psycho-social implications of disability and the travesty of injustices that contribute to it. 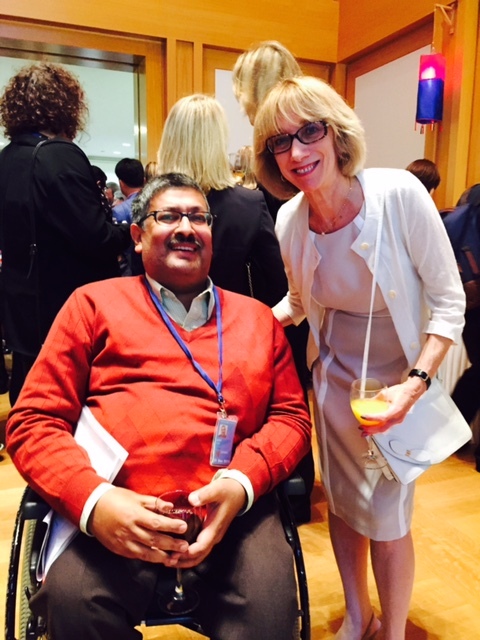 The United Nations is a magnificent concept, and gathered at this Conference of States Parties, are powerful allies of those with disabilities, so let’s hope that by this time next year, we’ll hear more about success and achievement and less about the avoidable casualties of man’s inhumanity to man. I grew up in Calgary, where I completed a BA at the University of Calgary, then travelled and taught in Kenya and the Canadian Arctic during the heyday of Trudeaumania, hippie travel and social experimentation. I settled in Vancouver to complete a Master of Social Work degree at the University of British Columbia, and stayed another 8 years. After graduating I was a Social Planner and eventually became the Executive Director of the Social Planning and Research Council of BC. Ontario March of Dimes recruited me in 1981, the International Year of Disabled Persons and the 30th anniversary of the agency. It has grown from a budget of $5m in '81 to $100m in 2010. Services have expanded drafmatically. We incorporated a non profit housing corporation in 1992 and a national charity in 2001, and since 2006 the latter has operated as March of Dimes Canada. We own and operate several properties that provide accommodation and independent living services to 77 people in 4 municipalities and will add another property this year. Two other exciting non profit entities have been incorporated in my 30 years (yes, it has been 30 years!) and we expect to hold our first fundraiser in the US this year and to initiate our first service south of the border also. My role as President and CEO continues to be that of creating a vision, fulfilling the mission and developing strategic plans to meet an increasing demand for services from people with disabilities and their caregivers. This is achieved through direct service, advocacy and peer programs. On a personal note, I live with my 17 year old daughter and two cats, and enjoy their company a lot. My two adult sons are doing interesting exploration in their own lives and I am intrigued with how they are progressing. In my spare time, I have various volunteer roles on several non profit boards and committees, and enjoy creating programs for building awareness of diversity and disability. I think it has become true for me that youth is, while not "wasted on the young," something that I appreciate more with age. Adventures are physically more challenging for me now, so they have to occur in new dimensions. One word – FABULOUS! Thank you for the update.